Peace of mind, it's easier than 1-2-3! 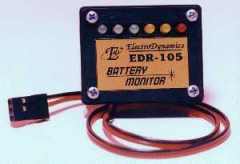 The EDR- 105 monitors your battery pack as long as the receiver is on. Install it on the side of your airplane or helicopter. The EDR- 105 is compact and will fit almost anywhere! Available for 4-cell (4.8V) and 5-cell (6V) systems.